The Songs of Solomon provide beautiful cameos of the intimate relationship between the King and his lover and reminding us of God’s love towards his chosen people. The songs point to Christ and his (Bridegroom) love for his own ransomed and redeemed people (Bride). Here we will learn more about daily communion with Jesus, the altogether lovely lover of our souls. Malcolm Maclean is from Inverness, where he is the minister of Greyfriars and Stratherrick Free Church of Scotland. Prior to entering the Christian ministry he was Managing Editor of Christian Focus Publications. 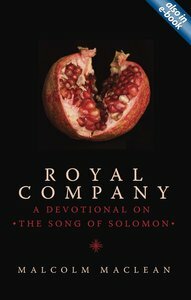 Among his other books is The Lord's Supper and a devotional on the Song of Solomon called Royal Company (both by Christian Focus). He provides daily readings on his blog 'Thoughts on God's Word and What It Says' (greyfriarsreadings.blogspot.com). He is married to Katie.